The Dwacon® Blog: Hey Moe! Yehudah Lev ben Shlomo Natan ha Levi, or Jerome Lester "Jerry" Horwitz to us goyim, was more famous as Curly… the most beloved of the Three Stooges. 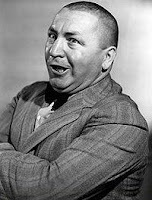 The brief clip appearing in the video widget below shows “Jerry Howard” in a bit of stooge-like slapstick with two other actors. But the best part is he is in color.